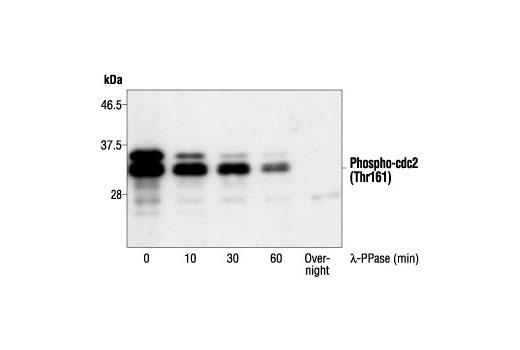 Western blot analysis of cdc2 kinase treated with lambda protein phosphatase (lambda-PPase) for the indicated times, using Phospho-cdc2 (Thr161) Antibody. 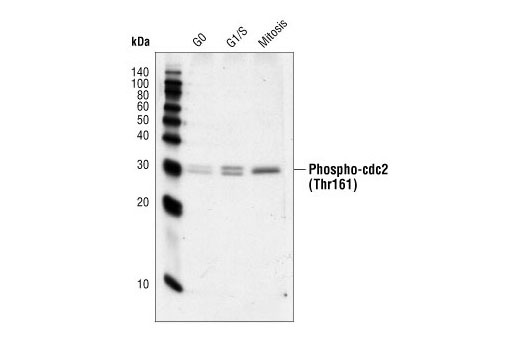 Phospho-cdc2 (Thr161) Antibody detects endogenous levels of cdc2 only when phosphorylated at threonine 161. The antibody cross-reacts with endogenous CDK2 phosphorylated at threonine 160. Polyclonal antibodies are produced by immunizing animals with a synthetic phosphopeptide corresponding to residues surrounding Thr161 of human cdc2. Antibodies are purified by protein A and peptide affinity chromatography. cdc2 activation and association with cyclin A require phosphorylation at Thr161 by the CDK-activating kinase CAK, a complex of CDK7 and cyclin H (7,8). Ducommun, B. et al. (1991) EMBO J. 10, 3311-3319.